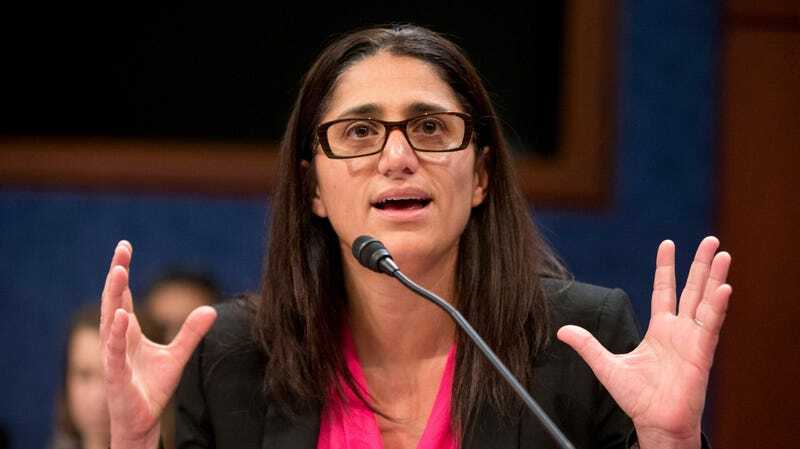 Dr. Mona Hanna-Attisha speaks during a House Democratic Steering and Policy Committee hearing on The Flint Water Crisis on Capitol Hill in February 2016. It’s been almost three years since Dr. Mona Hanna-Attisha was tipped by a friend, at a barbecue of all places, that the city of Flint, Michigan’s drinking water could be tainted by lead. For Dr. Mona, a pediatrician at Flint’s Hurley Medical Center, the months that followed were a non-stop search for the missing piece of evidence that would finally stir the government into action: proof that Flint’s children had been poisoned by lead in the city’s water supply. Dr. Mona’s new book, What The Eyes Don’t See chronicles her unrelenting efforts—and those of the many water experts, journalists, and activists she worked with—to expose the true extent of the damage done by lead in Flint’s water supply, the aftermath of what she uncovered, and her own personal story. Since publicly announcing that Flint children had dangerously high levels of lead in their blood in September 2015, Dr. Mona has become an unwavering voice for Flint’s children and an ambassador for Flint’s resiliency in wake of the water crisis (which isn’t really over). Earther spoke with Dr. Mona about her book, where Flint is now, and how the trauma that unfolded in Flint can influence children for their entire lives. Earther: Why did you write this book? What do you hope readers get out of it? Hanna-Attisha: I started writing this book over two years ago, because I knew even back then that the nation’s attention would fade on Flint. Understandably, there’s a lot of things going on. Yet we still needed to share our story, we still needed to share our terrible lessons. But more importantly, we needed a way to share the activism, to share the resistance, and to share the hope that we are building in Flint. But it’s also a lot about me, and my immigrant story. I came to this country when I was four. [Editor’s note: Born in England, Dr. Mona’s family was planning to return to Iraq before the rise of Saddaam Hussein’s regime.] You can’t know about my role in this crisis without knowing about who I am and where I come from. Earther: The beginning of the book details what inspired you to become a pediatrician. Talk to us about it. Hanna-Attisha: The most important part of that story is the interaction that I had with a doctor at that time. [Editor’s note: The interaction below refers to a car accident Hanna-Attisha was in when she was five years old.] I clearly recall being totally still in this hospital bed, not moving. I had broken my neck; I had fractured my jaw. My teeth were braced together. I recall this young doctor, who had dark hair and dark skin and a white coat, and she came to me and she held my hand. She told me I was in a terrible accident and she told me I was gonna be okay. And the tables were turned, literally thirty years later. I’m that doctor with the brown hair and the brown skin, and I’m holding the hand of a little girl, who was also in an accident that wasn’t her fault. Now it’s my job, my duty, to make sure that she’s going to be okay. Hanna-Attisha: I think the crisis—being discredited, having the science dismissed—really only inspired me to keep fighting more. I’ve always, as a pediatrician, had this deep obligation. I literally took an oath to protect children. This is very much my professional duty, but also an ethical and a moral obligation to these children. When our science, when our numbers, when our facts were being denied and dismissed, that only caused me to reground myself in that role as a pediatrician, in that role as a protector of children. [It caused me] to be even more stubborn, to be even more loud, to be even more of an advocate for these children. Earther: The last burst of national news on Flint happened when the state stopped doling out bottled water. What’s the status today in terms of people’s access to drinkable water? What more needs to happen for it to be drinkable? Hanna-Attisha: The state cut the bottled water supply and right now people are getting bottled water through churches and nonprofits like the United Way. There’s still a supply of filters and there’s still a home visiting program that helps folks install and maintain their filters. We’re still under a public health emergency. The recommendation is that people do continue to use filters or bottled water. A properly installed and maintained filter clears the lead. But there’s a lot of folks who don’t trust what’s coming out of their faucet, even when it’s filtered. The bottled water was really kind of a bridge—a bridge for safety, for access, for trust, and for affordability. It’s a lot of work that needs to happen to rebuild that trust. People need to remain on bottled and filtered water, but we’re already a third of the way through the pipe replacement. Once that happens, it’s only going to be the third city in the country that’s replaced their lead pipes, which is really amazing. Earther: From the book, you talk about how the trauma in Flint is a toxic stress. How do these toxic stresses manifest in the longer term? Hanna-Attisha: I think the most important concept in pediatrics and public health right now is the recognition of the role of early adversity and toxic stress on children’s development. Adverse childhood experiences and toxic stress, the more of those that you have without a buffering mechanism, impacts kids in a very predictable and graded fashion. The more that you are exposed to say, violence or incarcerated parents or poverty or lack of nutrition or any one of these toxic stresses, the more likely that you’re gonna grow up with risk factors, chronic diseases, and eventually decreased life expectancy. When we’re able to frame this water crisis as an added toxic stress, it really gave us a way forward. There is no cure for lead, or a cure for the trauma of this crisis, but this was a toxicity on top of so many toxicities that our kids already had—from poverty, violence, lack of nutrition , crumbling schools, and discrimination. When we frame it that way, we were able to holistically build a model of recovery that leans on the incredible and emerging science of child development and resilience to buffer the impact of this exposure. And that is absolutely one of the reasons that I wrote this book—to share how we are using science. We are leaning on that science of brain development and resilience to mitigate this crisis and hoping to serve as a model for other communities. The lessons that we learned in Flint are applicable and translatable to kids everywhere who are growing up with very similar toxicities. Earther: Can you tell me more about environmental justice, and how it has manifested in Flint since the water crisis? Hanna-Attisha: Flint already had suffered from environmental injustices in regard to industrial pollution and manufacturing. Areas in Southwest Detroit are layered with air pollution because of manufacturing in a predominately poor minority community. There’s so many examples of it in our nation where people who lack political clout disproportionately suffer from burdens. And Flint’s [crisis] is a classic example of an environmental injustice. The central tenet of environmental injustice is that people need to be part of the decision making process. And that was ultimately taken away in Flint because of a usurp to democracy. There was no accountability, there was no role of citizen engagement. The focus was austerity under the state-driven emergency manager. It clearly articulated that the demographics of the population not only precipitated the crisis but made it go on for as long as it did. Earther: There have been a barrage of recent reports about how children are being separated from their parents upon crossing the border. As a pediatrician, what are your concerns around trauma and the similarities to what Flint’s kids are experiencing? Hanna-Attisha: It’s the same thing. [It’s] exactly like the trauma of the children of Flint. As a pediatrician, we know what it does to children. We know that these traumas will leave life long scars in terms of their child development and their life course trajectory. These kids will need life long mental health support, which I very much doubt that they will get. What we are doing is essentially government sanctioned child abuse of these children. Earther: Throughout the book, we see how your dogged efforts and those of water experts, journalists, and advocates in Flint brought truth to power. What was the importance of collaborating as a united front after being stonewalled by the government? Flint’s [crisis] is a classic example of an environmental injustice. Hanna-Attisha: Flint is a story where folks got out of their silos and worked together to open their eyes and also to find that power within themselves to make a difference. That is one of the biggest lessons that I want to share—that role of activism, of resistance, with a village. I thought pediatricians had a monopoly on caring for children. I didn’t understand that anybody else could care as much about kids. But, hey, actually no. An environmental scientist and a journalist and moms and pastors and activists and the EPA whistleblower, this person and that person, all these folks cared about kids. So often in our professions and our work we tend to surround ourselves by people who are just like us. We don’t work with folks in other disciplines or people who don’t look like us or don’t vote like us. I think one of the important lessons from this story is that you are not alone and that there are villagers out there. You just have to go out and find them and surround yourselves. Together you are so much more powerful.